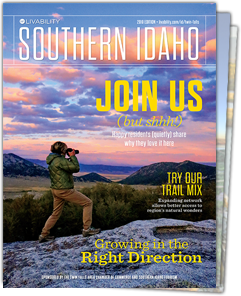 Southern Idaho has hundreds of miles of snowmobiling and biking trails, but don’t worry about crowds. Winter biking is just starting to gain popularity in the area, and Southern Idaho’s snowmobiling areas aren’t in danger of becoming too crowded: Only 3,500 snowmobiles are registered in Southern Idaho each year, which means you’ll have plenty of room to roam. The Trinities Mountains and the area around Fairfield offer miles and miles of snowmobiling possibilities. If you’re looking for a base closer to Twin Falls, the Diamondfield Jack area south of the city has more than 200 miles of groomed and marked trails of Sawtooth National Forest and Bureau of Land Management land. The trails are easily accessible by I-84. At Pomerelle Ski Resort, the Mount Harrison/Howell Canyon area has snowmobiling areas and a parking lot with a warming shelter located ½ mile below the resort’s base parking lot. Mountain biking doesn’t stop once the snow flies. Swap your typical mountain bike for a fat bike, which has 4- to 5-inch tires that are far more stable on snowy or icy trails. Close to Twin Falls, try the gravel trail at Auger Falls, accessible from Centennial Waterfront Park: Drive past the golf course until you hit the gravel parking lot and get on the trail. For a more technical challenge, try Indian Spring Road in the South Hills south of Hansen. Take Rock Creek Road to 2900 North and turn west to get to Indian Spring Road.